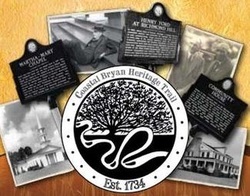 Welcome to the Coastal Bryan Heritage Trail! Here, you will embark on a journey where you will learn about many of the fascinating people and stories that make up the rich heritage of south Bryan County. You will imagine life in a Guale Indian Village, see the site where the founder of the Georgia colony built defenses to protect this land from possible Spanish attack, learn about an unwelcome visit from General William T. Sherman and the Union Army on their famous March to the Sea. Or picture yourself on an antebellum rice plantation - either as a wealthy planter or as an African slave. Learn how our little town of Ways Station changed forever after the arrival of new neighbors, who happened to be automobile magnate Henry Ford and his wife Clara. And how Ways Station became Richmond Hill. All of these events took place in an area of great natural beauty on the winding Great Ogeechee River known to generations of planters and their descendants as Bryan Neck. This driving tour of the Coastal Bryan Heritage Trail will take you along public roads, to the front of private homes and through historical, though still active cemeteries and churches. Please respect each of these places appropriately. 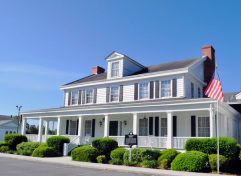 Maps are available at the Richmond Hill Museum, Fort McAllister, and the Richmond Hill Visitors Bureau. For a narrated driving tour, click one of the car icons below to download a Free Mobile Driving Tour App for smart phones and tablets. For more information, click here. Starting point: 9930 Ford Avenue: This wood-frame structure, situated on a site known since the creation of Bryan County in 1793 as “the Crossroads”, was built in 1939 with funding provided by Henry Ford. 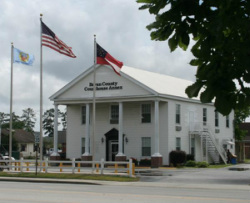 The building came to be familiarly called “the Courthouse” by local citizens. For many years it was used for civic meetings and as the official Richmond Hill voting site. The local Masonic Lodge and Order of the Eastern Star organizations held their meetings in this facility. Later, city and county governmental offices were housed here. Location: 31° 56.917′ N, 81° 18.7′ W. 9930 Ford Avenue Intersection of Ford Avenue (Georgia Route 144) and Ellis Drive. & Gulf R.R. was built across the nearby Ogeechee River into Bryan County. Near this site a train depot was built, which came to be known as “Ways No. 1 ½” for William J. Way, the first station master and a local rice planter on lands through which the railroad passed. A settlement grew up in the section between the railroad tracks and the Crossroads just to the west. It came to be called Ways Station, a designation that lasted until 1941 when the name of the community was changed to Richmond Hill. 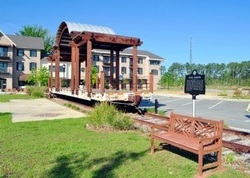 Location: 31° 56.667′ N, 81° 18.583′ W. 10220 Ford Avenue The marker is located at the old train stage area in Station XChange Shopping Center. In 1925, Henry Ford of Detroit, Michigan, a leading American automobile pioneer who perfected the assembly line concept of auto manufacturing, began acquiring large tracts of land on both sides of the nearby Ogeechee River. He sponsored extensive agricultural and forestry operations, providing the impoverished area with much-needed employment opportunities. Ford also implemented numerous civic improvements for the people of the Ways Station-Richmond Hill community, including medical, educational and cultural. Near here, on the river, Henry and Clara Ford built their winter home, Richmond, in 1936. Ford was active in the local community until his death in 1947. Location: 31° 56.65′ N, 81° 18.45′ W. 40 Richard Davis Drive Intersection of Richard Davis Dr. and Ford Ave. (Georgia Highway 144). The marker stands at the Richmond Hill City Hall. For nearly 20 years, J. F. (Jack) Gregory was the general manager and superintendent for all of Henry Ford’s various operations in and around Ways Station, later Richmond Hill. Serving for Ford from the 1920s until 1946, Gregory oversaw the activities of the Richmond Hill Plantation, a large agricultural enterprise that employed many local and area residents. Known as a hard-working, no-nonsense, manager, Gregory ran Ford’s operations with great efficiency and organization. Location. 31° 56.667′ N, 81° 18.433′ W. 85 Richard Davis Dr. 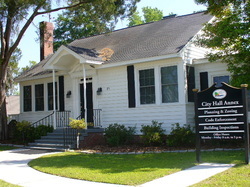 The marker is located at the City Hall Annex Planning and Zoning Office, formerly the home of J. F. Gregory (across from City Hall). The production of rice on Bryan Neck utilized upstream fresh water and the tidal influences of the Ogeechee River. Heavy wooden trunks, or tidegates, along the levees and embankments in the rice fields allowed the inflow and outflow of fresh water in an elaborate system of irrigation and hydraulics during the summer growing season. A network of canals provided access for the tending of the fields by large forces of slave workers. The peak of this activity was in 1860 when 1.6 million pounds of rice was shipped from Bryan Neck plantations along the river. 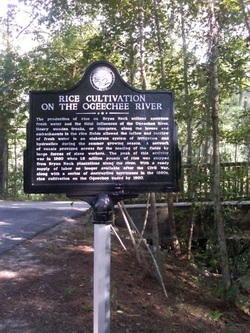 With a ready supply of labor no longer available after the Civil War, along with a series of destructive hurricanes in the 1880s, rice cultivation on the Ogeechee ended by 1900. Location: 520 Cedar Street Marker is located in J. F. Gregory Park just inside the entrance to the 3 mile trail. Visitors should park at the City Center. Marker is located to the right of the City Center. Outside of their expansive home on the Ogeechee River, this is the single most imposing structure built by Henry and Clara Ford during their sojourn in Richmond Hill from 1926 to 1951. Built by local labor in 1936 near the Ways Station School, the Community House served residents in the enhancement of their educational, social and cultural development. Cooking, home economics, sewing, dancing and other activities were taught at no cost to adults and children alike. Local social activities were held here, many attended by the Fords themselves. Location. 31° 56.5′ N, 81° 18.392′ W. 10512 Ford Ave. Marker is near the intersection of Ford Avenue (Georgia Highway 144) and Constitution Way. The Community House is now the Carter Funeral Home. Henry and Clara Ford had this chapel built in 1937 near the Community House and the Ways Station School. The chapel was named for the mothers of Henry Ford (Mary) and Clara Ford (Martha). Students from the nearby school utilized the Martha-Mary Chapel to conduct devotional services under the supervision of their teachers. The pews, tables and other furnishings for the chapel were constructed in the local plantation carpentry shop. Today, the chapel is owned by St. Anne’s Catholic Church. Location. 31° 56.467′ N, 81° 18.367′ W. 10550 Ford Ave. Marker is on Henry Ford Avenue (Georgia Highway 144) 0 miles north of Constitution Way, on the right when traveling south. The Martha-Mary Chapel is now St. Anne's Catholic Church. 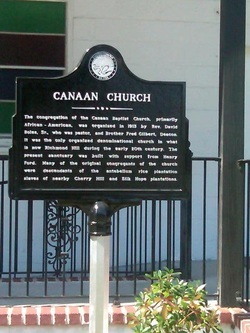 The congregation of the Canaan Baptist Church, primarily African-American, was organized in 1913 by Rev. David Boles, Sr., who was pastor, and Brother Fred Gilbert, Deacon. It was the only organized denominational church in what is now Richmond Hill during the early 20th century. The present sanctuary was built with support from Henry Ford. 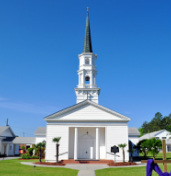 Many of the original congregants of the church were descendants of the antebellum rice plantation slaves of nearby Cherry Hill and Silk Hope plantations. “The Bottom” residential village, built in the mid-1930s, was the first housing project developed by Henry Ford for his employees in the Ways Station (later Richmond Hill) area. 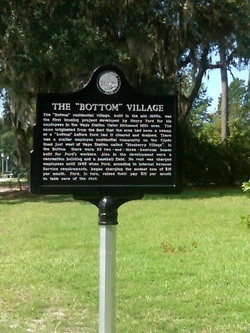 There was a similar employee residential community on the Clyde Road just west of Ways Station called “Blueberry Village”. In the Bottom there were 75 two-and-three-bedroom homes built for Ford’s workers. Also in the development were a recreation building and a baseball field. No rent was charged employees until 1945 when Ford, acceding to Internal Revenue Service requirements, began charging the modest sum of $15 per month. Ford, in turn, raised their pay $15 per month to take care of the rent. Location. 31° 55.817′ N, 81° 17.833′ W. 11460 Ford Avenue Marker is at the intersection of Ford Avenue (Georgia Highway 144) and Timber Trail. grounds are interred members of some of Bryan County’s most prominent early families, including those of Clay, McAllister and Maxwell. The original church accidentally burned in 1882 and a new edifice was built in 1885 several miles east, near Keller. 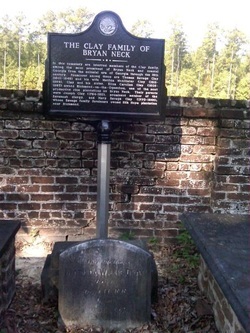 In this cemetery are interred members of the Clay family, among the most prominent of Bryan Neck and coastal Georgia from the colonial era of Georgia through the 19th century. Prominent among these are Thomas Savage Clay (1801-1849) and his wife Matilda McAllister Clay (1818-1869). Clay and his sister, Eliza Caroline Clay (1805-1895) owned Richmond-on-the-Ogeechee, one of the most productive rice plantations on Bryan Neck. Their parents were Joseph Clay (1764-1811), prominent member of the Savannah clergy, and Mary Savage Clay (1770-1844), whose Savage family forebears owned Silk Hope plantation near Richmond. Location. 31° 52.728′ N, 81° 15.695′ W. Marker is on Bryan Neck Road (Georgia Route 144) 0.1 miles south of Belfast River Road, on the right when traveling south. Buried here is George Washington McAllister (1781-1850), a prominent planter of Bryan County. In 1817, McAllister acquired Strathy Hall Plantation on the Ogeechee River where he cultivated rice and was one of the largest slave owners on Bryan Neck. McAllister built his plantation house, Strathy Hall, in 1838, restored by Henry Ford ca. 1940. McAllister and his neighbors, Thomas Savage Clay and Richard James Arnold, organized the Bryan Neck Presbyterian Church on this site in 1830. 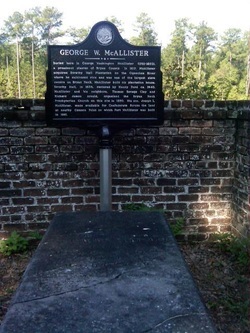 His son, Joseph L. McAllister, made available for Confederate forces the land at nearby Genesis Point on which Fort McAllister was built in 1861. 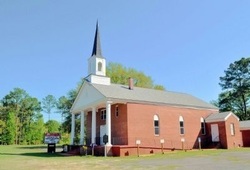 This church, the oldest congregation in lower Bryan County, was certified by the Presbytery of Georgia in 1830. Its founders included rice planters on Bryan Neck, among them Thomas Savage Clay, Richard James Arnold and George Washington McAllister. The first meeting house was constructed in 1839 three miles north of this site on the Bryan Neck Road. 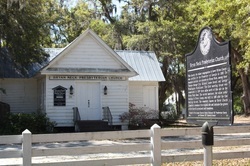 The current sanctuary, the oldest public building in Bryan County, was built in 1885 after the first building burned. The cemetery, known as Burnt Church Cemetery, remains at the original site and includes the graves of the church's prominent early members. Location. 31° 50.521′ N, 81° 15.671′ W. Marker is in Keller, Georgia. Marker is on Belfast-Keller Rd, on the left when traveling west. 8 mi E of Richmond Hill on Ga 144. Organized in 1869, this is the oldest African-American church congregation in lower Bryan County. The first structure for the church, a Prayer House, was built in 1870 on this site near the white Presbyterian Church (Burnt Church). London Harris, a freedman and spiritual leader of the local black community, was one of the organizers and first pastors for this church. The church was renovated and enlarged at the time the nearby Carver school was built in 1939. Location. 31° 52.266′ N, 81° 15.577′ W. 16525 Bryan Neck Road. 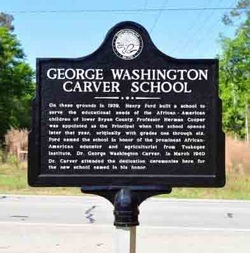 Marker is on the left when traveling south on Bryan Neck Road. here for the new school named in his honor. dispatches to the flag-ship [US] reporting the arrival of Gen. Sherman's army at Savannah. On the 14th, Kilpatrick moved with the balance of his command to Midway Church. After scouting the country and stripping it of livestock and provisions, he returned to Bryan and went into camp at "Cross Roads" to picket the country to the south and west, and to protect the Union supply depot at King's Bridge. (Directional Sign) East 4.5 miles, on Great Ogeechee River, Fort McAllister was built 1861-62 to guard the "back door" to Savannah. During 1862-63, it repulsed 7 attacks by armored vessels, some mounting 15-inch guns. Dec. 13, 1864, its small garrison of 230 Georgians was overwhelmed by Hazen's Division, 15th Corps [US], which had marched via this road. Its fall opened the Ogeechee to Union vessels which, loaded with supplies for Gen. Sherman's army, had been lying in Tybee Roads and Port Royal Sound. A wharf and depot were built at King's Bridge (on US 17) from which these supplies were distributed to the invading forces. Location. 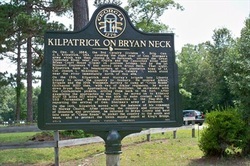 31° 53.401′ N, 81° 15.687′ W. Marker is on Fort McAllisterRoad (State Highway 144 Spur) near Bryan Neck Road (State Highway 144), on the right when traveling east. Explore the best preserved earthworks of the confederacy with this interactive, voice narrated and GPS enabled mobile app. 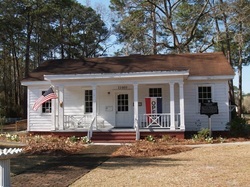 The Fort is located at 3894 Fort McAllister Road, Richmond Hill, Georgia. (912-727-2339) Hours: 8 a.m. - 5 p.m. Admission: $6.50 adults, $6:00 seniors, $3.75 youth, kids 5 & under are free. Download the free App for Apple and Android devices. Across the Ogeechee River from this point was the northernmost town of the Province of Guale, the village of Satuache. Spanish records place Satuache about 10 miles northeast of Guale’s provincial capital at Mission Santa Catalina (St. Catherines Island). Indian artifacts at the Seven-Mile Bend attest to Guale activity in association with the Spanish mission of San Diego de Satuache. The Guale town and the Spanish mission there were abandoned ca. 1663. The name Ogeechee is Indian in origin and means River of the Uchee, (“seeing far away”) for a village further north on the 245-mile long river. 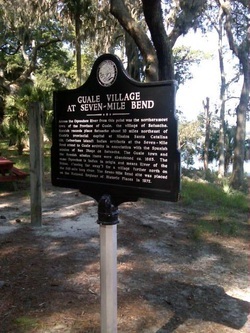 The Seven-Mile Bend site was placed on the National Register of Historic Places in 1972. Location: 3894 Fort McAllister Rd. 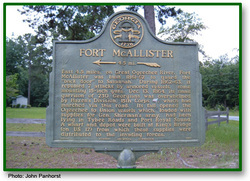 Marker is located at Fort McAllister State Historic Park by the fishing pier overlooking the Ogeechee River and Seven-Mile Bend. 1755 by Governor John Reynolds for the capital of Georgia. He named it for his kinsman, Lord High Chancellor of England, Phillip Yorke Hardwicke. Reynolds said: "Hardwicke has a charming situation, the winding of the river making it a peninsula and it is the only fit place for the capital." In 1761, Sir James Wright, the Province Governor, determined against the removal of the capital from Savannah. 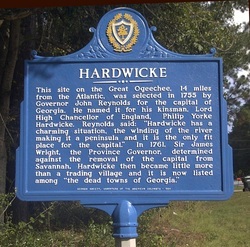 Hardwicke then became little more than a trading village and it is now listed among "the dead towns of Georgia." Location. 31° 52.981′ N, 81° 13.807′ W. Marker is on Fort McAllister Road (State Highway 144 Spur) 2.1 miles east of Bryan Neck Road (State Route 144), on the left when traveling east. 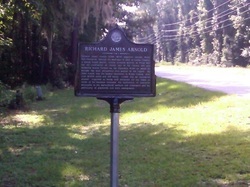 Richard James Arnold (1796-1873) acquired nearby White Hall Plantation through his marriage in 1823 to Louisa Gindrat. A Rhode Island native, Arnold invested heavily in White Hall for the cultivation of cotton and in his Cherry Hill and Mulberry tracts further up the Ogeechee River on which he became the most prosperous rice planter in the region. By 1860 Arnold was the largest landowner in Bryan County, with over 15,000 acres and 195 slaves. Arnold was an innovative planter, regarded as being well advanced for his times in terms of his business concepts, his application of scientific principles to his agricultural methods and techniques and his philosophy of plantation and slave management. 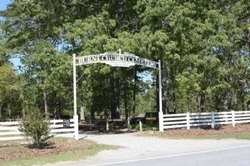 Location: 31° 53.15′ N, 81° 15.15′ W. Marker is at the intersection of Fort McAllister Road (Georgia Route 144 Spur) and White Hall Lane, on the left when traveling east on Fort McAllister Road.